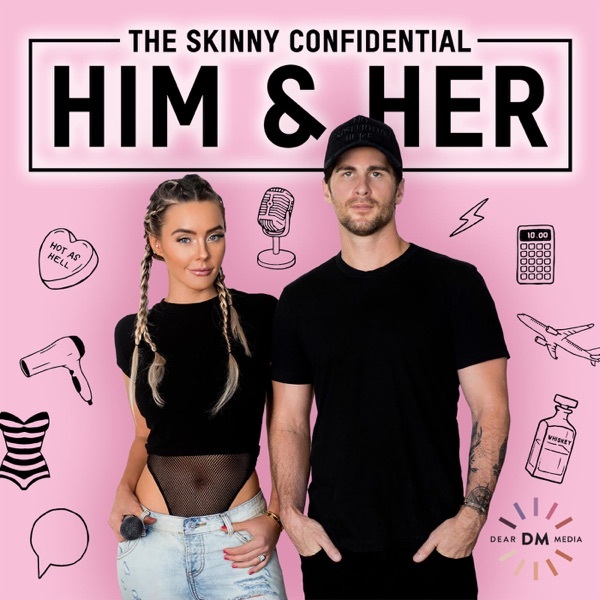 The Skinny Confidential Him & Her Podcast | Listen Free on Castbox. Copyright © 2002-2019 TheSkinnyConfidential.com. All rights reserved. #177: On this episode we follow up Lauryn's 73 questions (#174) episode with Michael's! Mimi Evarts plays co-host and asks the questions we have all been wondering. What are Michael's favorite tips, tricks, hacks, and resources. What are his deepest secrets and regrets. What are his most embarrassing moments and what are his most treasured memories? To connect with Mimi Evarts click HERE To connect with Lauryn Evarts click HERE To connect with Michael Bosstick click HERE Read More on The Skinny Confidential HERE For Detailed Show Notes visit TSCPODCAST.COM To Call the Him & Her Hotline call: 1-833-SKINNYS (754-6697) This episode is brought to you by Skillshare. Skillshare is an online learning space offering more than 20,000 courses. Join the millions of students already learning on Skillshare today with a special offer just for our listeners: Get two months of Skillshare for just 99 cents. That’s right, Skillshare is offering The Skinny Confidential listeners two months of unlimited access to over 20,000 classes for just 99 cents. To sign up, go to www.skillshare.com/skinny. #176: Dr. Barbara Sturm is a German aesthetics doctor based out of Dusseldorf, Germany. She is world-recognized for non-surgical anti-aging treatments and rejuvenation of the skin matrix. Dr. Barbara was part of a medical discovery known as the “Kobe Procedure” (as in Kobe Bryant) where a patient’s own blood cells are used to produce proteins to jumpstart the healing process. This process later became known as Vampire Facials. She is also the founder of her Molecular Cosmetics skin care line. On this episode we talk anti-aging, youthful skin, and European methods of keeping skin youthful. To connect with Dr. Barbra Sturm click HERE To connect with Lauryn Evarts click HERE To connect with Michael Bosstick click HERE Read More on The Skinny Confidential HERE For Detailed Show Notes visit TSCPODCAST.COM To Call the Him & Her Hotline call: 1-833-SKINNYS (754-6697) This episode is brought to you by CURED NUTRITION, a wholistic supplement company straight out of Boulder, Colorado. If you love organic, hemp-derived CBD products like we do, then you need to know about CURED nutrition. Their full spectrum of products works with your bodies system to produce better sleep results, decreased stress levels, and inflammation. All of their products are non psychoactive and they ship straight to your door. As always we have an offer for you to try. Go to curednutrion.com/skinny and enter promo code SKINNY For 15% off your entire order This episode is brought to you by THRIVE MARKET. We use Thrive for our online grocery delivery on a weekly basis and we also now get our wine at Thrive! They provide the highest quality products and ingredients delivered straight to our door with unbeatable prices. Be sure to grab our deal by going to to https://thrivemarket.com/skinny to receive 25% off your first order (Max $20) + free shipping and a 30 day trial. #174: On this episode Lauryn sits down with her sister Mimi Evarts and answers 73 hot button questions around goals, past relationships, random thoughts, and you know... the works! To connect with Lauryn Evarts click HERE To connect with Michael Bosstick click HERE Read More on The Skinny Confidential HERE For Detailed Show Notes visit TSCPODCAST.COM To Call the Him & Her Hotline call: 1-833-SKINNYS (754-6697) This episode is brought to you by CURED NUTRITION, a wholistic supplement company straight out of Boulder, Colorado. If you love organic, hemp-derived CBD products like we do, then you need to know about CURED nutrition. Their full spectrum of products works with your bodies system to produce better sleep results, decreased stress levels, and inflammation. All of their products are non psychoactive and they ship straight to your door. As always we have an offer for you to try. Go to curednutrion.com/skinny and enter promo code SKINNY For 15% off your entire order This episode was brought to you by Fabletics. Your new go to for all athletic wear. Fabletics is offering our listeners an incredible deal you don’t want to miss: Get 2 leggings for only $24 a ($99 value) when you sign up for a VIP membership. Just go to Fabletics.com/skinny to take advantage of this deal now. International shipping is available and there is absolutely no commitment when you purchase your first order! Fabletics.com/skinny Terms and conditions apply. this is one of the best interviews so far. i like the blueberry Rx bar. Fun commercials too. Can you list the podcasts you listen to I couldn't write them in a right way from hearing only,,, ummm I'm Arabian that why so please help anyone? This episode was really good! I'm terrible about scrolling IG when I wake up and I know it's a terrible routine. Thanks for the inspiration! You should search the benefits difference between wet brushing and dry brushing! I'm new to podcasts and this is one of my favorites!